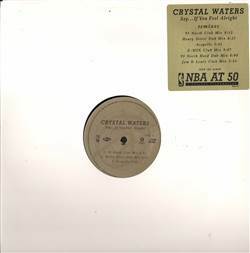 Crystal Waters - Say...If You Feel Alright 12"
HOUSE, Mercury, USA, 1996... Say... If You Feel Alright (95 North Club Mix), Say... If You Feel Alright (Henry Street Dub Mix), Say... If You Feel Alright (Acappella), Say... If You Feel Alright (X Mix Club Mix), Say... If You Feel Alright (North Hard Dub Mix 95), Say... If You Feel Alright (Jam & Lewis Club Mix). JSJ - Deep Love 9 (Over-Relatively Dubbed Mix) 12" 15pearl - 15pearl EP 12" Unknown Society - Reach Higher 12" Boogiemen - Not Looking Forever (Hit It) 12"
Sharon Phillips - Touch Me 12" Isis - Meditate ('96 Remix) 12" Adamski - The Space Jungle 12" Mr. Roy - Show Us Your Meat Hole 12"